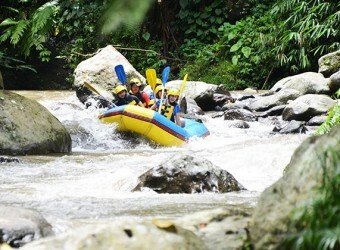 Bali Activity A local Ayung River rafting company, Graha Adventure is wellknown among tourists. They provide rafting with the most reasonable prices. Because of the price, facilities arn't perfect and well maintenance, but the rafting course as good as other companies, the 12 km course with a guide and choice of levels, intermediate and advanced is available! ・This special price is applicable with Booking Darna transport car charter service. ・Meet the river guide for each group which has 4-6people..
・Put a camera, valuables, and some change of clothes in the waterproofed bag that the river guide brings to the start point. ・Go to the river side on the river by taking about 450 steps down. ・There are great photo spots of rice view. You will put regular cameras in the water proofed bag, so waterproofed ones are recommended to bring with you. ・Rafting starts after the lecture on the boat (a way to hold oars & calls). ※You can wear shoes or leave then in the waterproofed bag during the rafting. There are 2 short breaks in the middle. You can take photos with the relies. Locals come to sell drinks(not price included), so you can buy it if you want. You can spend the breaks swimming in the river as well! In the 2nd break, the boat stops at the big water fall. ・The shower is next to the finish point. You can use a free rental towel. ・Enjoy the dayly Nasi Cample is a refill free. Drinks (mineral water, coffee and tea) and desert are available as well! ・You can buy the rafting photo（15～20 pics in CD：Rp.300,000） ・Take about 390 stairs up to go back to the car in the parking lot. Leave to the center of Ubud. Go over the insurance. Including welcome drink (orange juice). The restroom and the changing room are very simple, so we recomend changing at hotel. Rafting & safty equipment are next to the reception. The staff help them into them. Leave a camera and valuables in the waterproofed bag that the guide brings to the rafting. Take about 450 stairs down to get to the start point. You can wear shoes or leave them in the waterproofed bag! You have to take the stairs, so it is better to have comfortable shoes. You can take photos with the relief. The water shower room. You can use a free rental towel and liquid soap. Nasi Campur lunch including fruits mineral water, coffee and tea are a refill free! It about 8 hours. The extension is available by additional ＄14/hour. Can we change clothes at Graha Rafting after we arrive at the reception? How many people can fit in one boat? The maximum 7 people (6 customers and 1 river guide) can be in one boat. The one tour has 20 boats which means maximum 120 people can do rafting together. What shoes are recommended for rafting? You go rafting by the shoes with straps on the feel or bare foot. You have to take about 450 stairs on the way and about 390 stairs on the way back, so you can do them with the shoes and do rafting with bare foot. Where should I leave a large bag? You will leave it in Agus transport car. You can bring the valuables with you to the rafting. How should I keep the valuables? Each boat has a waterproofed bah, so you can put them in it. Please note the insurance doens not cover compensation for the belongings. Should I bring change of clothes to the rafting? There are the shower and the changing room at the finish point of the rafting. The parking lot the car waits is far, so only a few changes to bring are better if necessary. Can we take photos during the rafting? You can take photos with the relief or at the break points and can buy the rafting photo by a photographar of Graha Adventure (CD including 8 photos data/Rp.50,000). What are the facilities after the rafting like? The separated changing rooms and the water shower are available, but are both simple structures. Liquid soap and a free rental towel are available. Is there any limit to join the rafting? ※The price, contents and schedule might be changed without any notice. ※The insurance doens not cover compensation for the belongings. ※Please note that some facilities are not well organized and maintenance due to the reasonable price. I don’t understand either English or Indonesian language so I didn’t understand what the staff explained about the rafting.LOL But I was relieved because he explained to me front paddle, back paddle, etc.